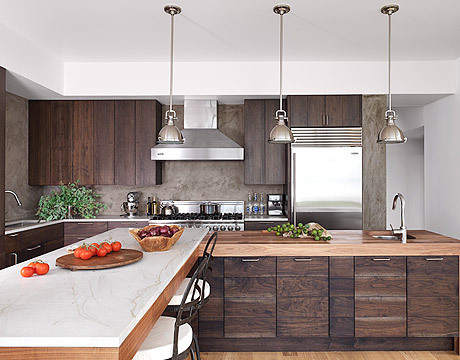 Love this beautiful kitchen from House Beautiful's website. The home was designed by Alexandra Fazio of Cecil Baker & Partners in New York. The cabinets are all walnut and the island, with the Waterfall Edge, is walnut as well. 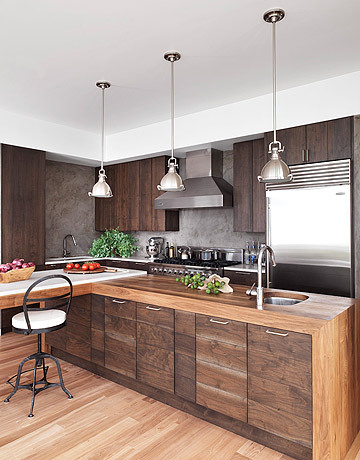 The wood on the island countertop is unstained and treated with food oil. It's a great contrast to the cabinets. The countertops on the other side of the island are Luce di Luna quartzite....which I happened to talk about yesterday as well (aka White Moon). The walls aren't concrete like they look to be, they are actually plaster. The look is great, but I'd probably do a tile splash of some sort if this were my kitchen.